Sometime last term, one of my students told me she was getting married soon. Actually, because her English is terrible, she mimed the act of putting on a wedding ring. At the time she also asked if I would come, and I said sure. The term ended and the classes rotated and while I saw her a couple times in the halls and always said hello and exchanged kisses (Saudi greetings are multiple cheek kisses), I didn’t hear anything more about the wedding. Then on Wednesday, she comes to tell me it’s the next day! Planning ahead hasn’t really caught on here in many ways. She couldn’t really explain where it was however, so we went over to the AA’s office to get some help. It transpired that I had misinterpreted the wedding ring sign language and the party was actually an engagement party. My AA sent an email with the name of the location in Arabic so we could get it to the driver. Saudi doesn’t use addresses, but this building (I was told) was known to every Saudi in Tabuk because it is used for all the weddings. Once the times and locations were sorted out, next I had to figure out what to wear. Saudi weddings and engagement parties are a real excuse to dress to the nines. All those stores I pass in the malls that sell decadent evening gowns are catering to the wedding crowd. I myself had no such beautiful gown, the majority of my wardrobe is tailored around the school dress code, or my weekend adventure needs, neither of which is fancy. Fortunately, I had just found a beautiful black velvet skirt on sale the week before. I had thought it was just going to sit in storage until it was time to go back to the much cooler PNW, but I decided it would be a good choice for a formal party. Sadly, all my non-stretchy blouses that had been sitting in the back of my closet as too hot/formal for school wear had mysteriously become slightly too tight to be flattering. Something about spending the holidays away from home may have led to a serious reliance on comfort food. I managed to find some stretchier tops that could be dressed up decently by the right hair and jewelry, and made a solid determination to curtail my afternoon snacking. I didn’t have time to go to a salon, so I had to rely on a classic French braid ending in a bun topped off with one of my velvet and sparkly scrunchies from China. Long dangly earrings, and bracelets and rings on both hands finished off the outfit. I went for dramatic eye makeup since it was a late night affair. (It would turn out I had some of the most understated eye makeup there). My driver was 30 minutes late, which was really frustrating because I had said I wanted to go after Isha’a (the night prayer), and he agreed he would come pick me up as soon as he was done praying. I asked him about what time that would be, and he said 8 or 8:15. He could have said 8:30 or 8:45 and I would still have been fine with it, I just hate waiting! So there I was, sitting around dressed for 30 minutes because I didn’t want to keep him waiting. I miss my car. I arrived at the place, a huge building, the men congregating around the front entrance, and another gate off to one side with a tiny entrance for the women to slip through. Inside was a large courtyard where I could see dozens of women in various types of dress milling around and moving from one building to another. It occurred to me then that I had no idea where to go, nor did I have my student’s phone number. However, it is a testament to my cultural adjustment that this didn’t bother me, because I knew someone would help me. I was not disappointed. A lovely middle aged lady soon realized I didn’t speak Arabic well, and switched to English. I told her my student’s name and that I was her teacher, and she asked if it was the Bride or the Bride’s sister. This flummoxed me slightly, since I had been told it was an engagement party and not a wedding, but you learn to roll with it. She led me across to the other building and knocked on doors and made inquiries until my student appeared. Before leaving me, she made sure I knew I was welcome to come and sit with her should I not have a place to sit as events unfolded. I adore the culture of hospitality in this part of the world. I almost didn’t recognize my student when I saw her. Normally in class, she is a slight girl who dresses as tomboyish as is possible while still wearing a skirt. Once or twice I saw her come to school with makeup and had been surprised by the contrast, but she’s never struck me as “girly”. Now she was dressed in a stunning gown in a dusty red color offset with sparkling patterns of gold thread, sequins, beads and other sparkly bits. Her hair would have made Marie Antoinette sit up and take notice. She had always lightened it to a nice light auburn, but now it was up up up and big with falls of complimenting strawberry blond curls cascading from the top and gold and diamond pins dotting the main part of the do. Her makeup was no less extravagant. 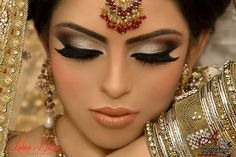 Huge eyes with deep khol lining, metallic gold eyeshadow and long false lashes. Her lips were plumped out with a wide liner and beautiful shade of red that complimented her skin and the dress. And her hands and forearms were adorned with intricate spirals of henna. Taking pictures is very against the culture, and when they are taken, it is for personal use only, so I don’t have any pictures, but you can imagine something like this dress, this hair (but auburn with jewels instead of flowers), this eye makeup, and this henna. When she spotted me we instantly became woo-girls, which it turns out is an international language. Not just polite cheek kisses, she embraced me in a full hug and told me over and over how happy she was that I came. We complimented each other’s dresses, I hugged the other student that was with her, and was quickly whisked off to another part of the building. Any doubts I had about attending or my dress or what to do were completely settled by the sheer joy that it brought to this girl that I came. I’m always seriously surprised and flattered when I find out my opinion matters so much to someone, and as a teacher I’m especially impacted when I can see I’ve touched a student’s life. I was introduced to a whirlwind of ladies, cousins, nieces, aunts, mother, grandmother. I really hope no one was sick because I was subjected to sooo much affection. I was given Arabic coffee and sweets from the table in the reception room. Trying to shake hands while balancing these was very challenging, and between her excitement and my precarious balancing of too many things in my hands, we managed to knock the small cup out of my hand and narrowly avoided spilling it all over our dresses. Having met everyone I needed to meet in that room, we headed back to the main hall. The room was set up with a stage and catwalk. I couldn’t take pictures, but I found this image online that gives a pretty good idea of the set up. Tables with carafes of Arabic coffee and sweet mint tea and plates of sweets filled the rest of the large room. Ladies filtered in from the reception hall and took their seats, passing around the coffee and sweets. I went through another round of introductions, handshakes and cheek kisses and was offered far more sweets than anyone could eat. I noticed that only a dozen or so women were as fantastically dressed as my student. Most of the the younger women were dressed not unlike myself, in something fancier than every day wear, but not extravagant. There were another dozen or so all in matching deep burgundy velvet dresses, and a lot of the older women were wearing abaya and hijab, though in stark contrast to the daily all black affairs, these were brightly colored and bedecked with sparkling embroidery or beads. The entire affair felt like the four corners meeting of the 80s, Disney Princesses, Drag Queens and 1,001 Arabian Nights. There were no actual drag queens of course, but I think that some of these outfits (dress, hair, shoes, makeup) would be right up their ally. Then the music began. Music is a challenging subject in Islam. It has been explained to me that drums and vocals are generally accepted even in the more conservative parts of the culture, but that other instruments are more controversial. In my experience, its very personal. Some people will listen to anything (East or West, even dubstep), some will listen but only if the lyrics are not haram topics, some will only listen to Arabic music from other Muslim countries, some will listen to only drumming and vocals, and some will listen only to the Quran. This student had been from the class that begged me to play music and dance any time we finished our work early, so it didn’t really surprise me that there was some lovely dancing music. There’s a sort of modern Arabic/hip hop fusion thing that I’ve heard several times here and am becoming quite fond of. It’s really great to dance to. The dances seemed to have some meaning, but since my Arabic is very limited and the students of mine that were there weren’t very high level (plus the music was very loud) I didn’t really get any explanations. Some dances seemed reserved for just the fanciest dressed ladies, and others open to anyone. There was one dance where mostly older ladies (all in their fancy abayas) got up and danced with meter long sticks that had been decorated with colored strips of cloth. Other dances seemed to be associated with specific types of dancing depending on the music, some focusing on dancing steps in a circle, others a hip focused kind of belly dance, others more swaying and arm oriented. All the while, young children frolicked around the fancy dressed ladies. No leaving the kids at home with the sitter, I saw women in fancy evening gowns and salon hair-dos picking up babies and trailing small children as they danced. After a half dozen or so dances, the lights were dimmed and all eyes swiveled to the back of the room where, just like a western wedding, the double doors opened to reveal the bride. I found out later that this was my student’s sister, making it some kind of combined wedding and engagement party. While the rest of us studiously kept our cameras turned off, there was one official photographer to take pictures of the bride. As they passed by, women who thought they might be in frame quickly donned their hijabs or simply draped them over their heads and faces until the camera passed. The bride walked very slowly down the catwalk toward the stage, not to any classical music, but to the same modern fusion dance Arabic music we’d been listening to before. She took one tiny step every minute or so, allowing people to admire her, the photographer to take pictures and her attendants to keep the dress in perfect position. All the while her bridesmaids (all those women in matching burgundy velvet dresses) stood on the stage clapping rhythmically and occasionally bursting into cheerful screams. Once the bride ascended to the stage, she moved to the wide bench at the center and after posing for a few more photos, sat down. People came by to pay their respects, or congratulations, and sure enough, my student led me by the hand and up onto the stage to meet her sister. Those of you who have been following the blog up to now know about the extreme gender segregation in Saudi. Men and women who are not related aren’t supposed to interact socially (professionally is acceptable with oversight). Weddings are notoriously social events, and of course all these beautifully dressed ladies could never let a non related man see them uncovered. So the men have their own celebration on the other side of the building, do their own dances and celebrate the groom. My understanding is at some point in the night, the men will come over, sending the women diving for abayas, and join the bride and groom together. But in the mean time, the bride gets to walk down an aisle of sorts and spend some time being the center of attention in an uncovered state. After a few more formalities, the dancing resumed, and my student led me up on to the catwalk to join her in some dancing. Soon the other students that were there at her invitation joined in and we had quite a good time being silly and dancing. It’s amazing to me how not-body-conscious the women there were. I had felt uncomfortable getting ready because I wasn’t as sleek in my dress clothes as I wanted to be, but there were women of all body types there, dressed in figure hugging dresses and dancing their hearts out with clear joy. From talking with some of my larger students, they are interested in loosing weight, but it seems to be more health than beauty oriented, and they certainly don’t act or dress the way I do when I’m feeling fat, or the way I’ve seen many American women do when they are told they’re fat (eg loose/baggy/slobby clothes). After some dancing, it was time to eat. My student led us over to another room where the floor had been set up with the traditional lamb kabsa. Squares of plastic sheeting were laid down at intervals, and a large platter of rice and roast lamb is placed in the center of each one. Side dishes and drinks are placed around for guests as well. Again, I have no pictures of my own, but this is a fair representation. Kabsa is meant to be eaten with the hands only, but my student politely provided us with spoons. I was seated with another of my students from the advanced class and was able to ask a few questions, and get some help understanding the comment’s from the bride’s mother who stopped by to check that I had everything I needed and opened up some new side dish containers for me. I am a sucker for lamb, so I always enjoy kabsa. This one was interesting because there were also large chunks of lamb fat, not just the bits stuck to the meat. I encountered this first in northern China. There’s a tendency of poorer, rural areas in the colder months especially to consume animal fat in equal or greater quantities of actual meat. And lamb fat, when cooked well, isn’t tough gristly stuff, its creamy and rich, so much so, I tend to enjoy it in very small bites, but I think I could happily spread it on toast. It seems strange to a lot of Westerners, since we’ve become obsessed with lean meat, low fat diets, and while I wouldn’t want to eat it every day, it’s certainly a delicious addition to special occasions. By this point in the evening, it was nearing the time I’d asked my driver to return for me. Since I wake up at 6am, and haven’t yet mastered the art of afternoon naps, I’m usually in bed by 9:30. Tonight I’d asked the driver to pick me up at 11:30, hoping this would give me enough time to enjoy the evening and not leave so early as to offend. I guessed well, since dinner seemed to end a little after 11, and there were many other people gathering their things and heading out. When I went back into the main room to find my student and bid her farewell, I noticed that the bride was no longer seated at the dais. I wondered if the men had come to carry her off like I’d read about or if she’d simply joined her new husband in private somewhere before heading off to their honeymoon suite. I found my student and let her know my driver was on his way. She didn’t seem surprised or dismayed, which was a relief. She came out to the waiting area with me and tried to talk again once we were out of earshot of the loud dance music. She showed me pictures on her phone of the young man she was engaged to. He was handsome in a boyish way, and his smile contained kindness and humor, so I hope that turns out to be true. She asked me again if I was happy, and I told her I was so happy to be able to come, and to see her looking so beautiful. She seemed to harbor some apprehension, and told me shyly that she was going to meet with him that weekend. In Saudi, an engagement is a contract similar to marriage, so the couple are allowed to spend time together. I asked her if she was nervous, but she didn’t know the word. So I asked if she was happy, and her face showed my first guess was right. I put my hands over my heart and made a fluttery gesture, and she made a fist over her chest and pumped it like a fast beating heart, nodding in agreement. I smiled and hugged her again. I remembered some of my first date anxieties, and I’ve spent my whole life socially interacting with boys. I can’t even imagine how scary and exciting it must have been for her, but we had no words to communicate these things, so we just hugged and smiled. It seemed to help. As I donned my abaya and hijab to go, she told me she was sleepy too and would be going home soon. And after a final round of hugs and happies and beautifuls, I headed off to the parking lot to find my driver and get home. Recently, I’ve been finding myself despairing of the location I’m assigned to. Tabuk is a small town, and many of the things I miss or find frustrating aren’t problems in cities like Jeddah or Riyadh. Expats there can easily get wider choices of food, better exercise and entertainment options and easier travel options both in city with Uber or taxis and out of country because they are major international airports. Just like living in a small town in England or America can be boring or stifling compared to London or New York. But nights like this are the real reason I love to live abroad. Being able to make connections across cultural and linguistic barriers, to be accepted into people’s lives and make a valued positive impact means so much more than a better grocery store or bigger mall. So, while I might miss out on nighttime walks by the sea (Jeddah) or easy taxi access to the Diplomatic Quarter (Riyadh), there are some trade offs that make spending a year of my life in a small town a totally worthwhile experience. I recently read another travel bloggess who pointed out that living in a foreign country is a constant, daily struggle to do ordinary things. She wasn’t complaining. Like me, she seems to love her life abroad, but when she described her own battles with visas, banks and other things we barely consider in our home countries she painted a picture of riding the metro back from yet one more frustration in tears, consoling herself with a kinder Bueno bar, and I laughed. Not at her pain, but at my own. It was briefly joyous to see that I was not alone and to remember that all of us who choose this life are facing the same struggles no matter what country we land in. That being said, my recent trials and tribulations with the phone and bank systems here in Saudi have finally taken a positive turn. When last we left our intrepid heroine in Episode III, she thought that the phone issue was resolved in her favor, having achieved the unlimited data plan on the prepaid SIM. Oh, but wait. Remember that post paid bill? The one I couldn’t pay because I hadn’t been able to open a bank account because my name was spelled wrong on my Iqama? It came back. Finally able to pay it, I went online only to discover that I had been billed for another month even though the phone company had turned off the line, and I’d gone into the store to switch to the prepaid. The bill, which should have been 200SAR for the one month I used it, and had been inflated to 275 for reasons I never understood, had been inflated a further 200 to 475 while I was waiting for my bank account to open so I could pay it. Not from late fees, like we expect in the US, but from a whole other month of active billing on a SIM card that had been deactivated and was in a box! I went online to the chat help place. The first time, they said they had to send the issue to “Technical Support”. I feel like this is a language barrier issue, because I’m like no, it’s not tech support, it’s billing, but the guy refuses to help me further and says I have to try again after 24 hours so Technical Support for Billing can look at the issue. 24 hrs later I try again, get another dude, who after some time finds that the resolution is that my account has been credited 175SAR.. not the full 200, but better than nothing. The big problem is that his English is so bad, I don’t understand this the first 4 times, because he just keeps copy pasting the same grammatically confusing answer. I don’t know if these guys are using Google Translate or some automated answer system, but I was on the English support site, so it’s not like I was expecting regular people to speak English, I was expecting the people hired for the job of helping English speakers to do so. Silly me. He also kept calling me “sir” over and over, even though I kept saying I was not a “sir”. Once I finally figured out the credit issue, I then said, ok, lets cancel the line so I never get billed again. But he can’t do that, I have to go into the store… again. You know, the people who wouldn’t let me pay the bill with cash and didn’t bother to tell me that them turning off the service to the line was not the same as the line being cancelled. At which point he apologized, told me he could not help me and disconnected. Maybe he was just tired of trying to explain the company rules and policies to me. After all, I’m used to being able to pay a bill or cancel a service on the phone or the internet, and it seems to me that having that technology, Saudi would want to use it to keep more women at home? But it sure seemed like he flipped out and ran when he realized he’d been talking to a woman. *shrug. So the next workday, a Sunday, I get online and pay the 275SAR that was my first bill, leaving the rest unpaid (the supposed credit is not reflected in my account). I head back to the store after Asr (afternoon prayer) and have another protracted, whining conversation with the poor guy designated to help the women folk. We can’t go in to the main store unaccompanied. I guess the only reason I was able to go in when I went to set up my phone the first day was because a male co-worker was with me (to get a router for himself) and they assumed we were married. It’s the same guy who helped me the last time with the bill I wasn’t allowed to pay and getting the prepaid card up and running. I explain the situation to date. He says I have to pay 74SAR to cancel it. Why? because 475 – 275 that I paid, -175 credit which should equal 25, but I’ve been billed 49 more SAR for the part of the month since the last billing cycle! I think this might be worse than late fees or interest. If you can’t pay for some reason, you both get your phone cut off and continue being billed at the full rate until you can? Technically avoiding the sin of usury while still sticking it to the people, what an astonishing grasp of capitalism! I explain the absurdity of the fact that the company turned off the phone line, it was not my choice to stop using it, so why am I being billed for a phone line they turned off? The clerk says he can escalate it to STC (isn’t that where I am?) and I can come back another day. Another day!?! I feel like I’ve been fighting this battle for months (which I probably have) and cannot face the idea that I must arrange with the driver yet another day, to get home from work and wait the hour until prayer is ended to get back into my abaya and hijab and ride through traffic and wait in this tiny boring room to be told once more that it can’t be done. Suddenly 74SAR seems like a small price to pay to just be finished. Fine! Fine. Finefinefine. I’ll pay. So he goes away again and comes back to tell me that I’ll get a text message with the final amount and once I pay it they can cancel the phone… at this point my eyes are twitching involuntarily. He’s telling me that he’s still not cancelling the phone! I’m not receiving a text. The phone number that I’m cancelling is not the SIM in my phone. No problem, he says, the battle cry of the Saudi, I can put it in the phone when I get home and I’ll see the text. There’s a moment I experience where I’m so incredibly frustrated, angry, whatever that I cross over some kind of event horizon, and enter the eye of the storm. I become unreasonably calm. This happened. I patiently explained that I would never recieve this text, because the SIM was suspended by the company and would not receive texts. I know this because it is how I found out the number was suspended in the first place. No problem! he says, it can still get texts from STC. No. The calm is a physical force at this point. It can’t. Punctuation stabbing at the pauses between words, silently containing my outrage. I know it can’t because when I first noticed the line stopped working, I tried to log in to the website to figure out what was going on. They text you a PIN to log in, and I never got those texts, so couldn’t log in to the website. Those texts were from STC. I distinctly remember thinking how ridiculous it was that the company blocked my ability to receive it’s own messages including those about billing. I remembered that the last time I was in the store to pay the bill, he had asked me for an ATM card (which I did not have yet, and for some reason a credit card wouldn’t do). But since then, I had opened my bank account and had my shiney new ATM card. Why can’t I just pay it now? What? I can? Oh yay! So he has me step outside so I can enter the main store (where I was not allowed to be 30 seconds ago) so I can swipe my ATM card and enter my PIN to authorize payment. This is another mind boggling aspect of the culture here. If it’s so important to separate women (for whatever justification) then why don’t you have a payment option for the separate women’s enclosure? And if we’re going to come in the main branch to pay, why keep us out at all? Finally, I have paid the bill and am given the cancellation paperwork to sign. The line is paid in full and cancelled. I recieve texts on the prepaid line, now the only one linked to my Iqama, to tell me as much and breath a deep sigh of relief. A huge amount of frustration and about 525SAR later, I’ve learned that post-paid phones in Saudi are a total rip-off. But now I’m free. As you may have surmised from the above, our intrepid heroine has managed to acquire a bank account since her last adventure. The new Iqama arrived and I learned that the way that the Saudis make the hard “ch” sound with no equivalent sound in their alphabet is to put the letter “teh” in front of the letter “shin” looking rather like “tsh” and I can sort of see how that sounds like “ch” so there you go. Lots more paperwork later, I get my ATM card and a print out with all the necessary bank numbers and info like account and IBAN numbers. I am then directed upstairs to the tellers to deposit my cash. Victory! I have an account, there is money in it, I can pay my phone bill, buy my own airline tickets with SADAD and start sending money home! I can’t link my Saudi account to my US account from the US end. I can open a paypal account in Saudi, but can’t link it to a bank account like you can in the US. So my only send money home option is to link the US to the Saudi account on the Saudi end. Which I am assured I can do online. So I hop on the website to discover that the security regulations are a little over the top. Not just the first, but every time you log in, they send you a new code via text. Then while adding the account (called a “beneficiary” on the website) I have to receive several more texted codes to enter and verify myself. In the end, I have to forward a text to another number. I get a text back telling me to call “Sambaphone” to activate the beneficiary. So, I hunt around and find this entity, call it, enter my exceedingly long ATM number (even though I am calling from the phone linked to my account) and am then told that I cannot use Sambaphone because I don’t have a secret Sambaphone code and that I must go to an ATM or branch to get a secret Sambaphone code. Now, why in the world the bank didn’t have me create this code when I opened the account and chose my ATM pin I will never know. I’m sure if I were Saudi, I’d know I needed to ask, but of course I didn’t know, so now I have to go back to the bank. Setting up the phone code was pretty easy. And I decided since I was in the bank, it would be easier to just have them add my US account while I was there. Except the clerk had no idea how. When the online attempt failed, I had recieved a text message telling me to remember to include the ABA (routing number, which is what US banks still use instead of an IBAN, because we can’t join the rest of the world in using metric, Celcius or international banking codes). I have my ABA, but there is no place on the form to enter it. I explain all this to the clerk, that I know what the ABA is and have it, but I just don’t know where to put it. Neither does he. So who can we ask? Surely someone in this building somewhere knows how to do this? But no, he’s going to do it himself. He takes me over to a terminal and has me log in to the website and go through the process of adding the beneficiary again, because he is sure the reason it didn’t work was because I didn’t have my Sambaphone code so I couldn’t complete the final verification step (despite the fact that I showed him the text about the ABA). We then use the Sambaphone to submit the final authorization and he tells me it may take a few days to be fully set up but everything is fine now. I mention again that we did not enter the ABA, so I doubt this, but he is sure and we are done. Even before I get home that day, I get a text from the bank identical to the first, letting me know it failed and not to forget the ABA. At least now I have my secret Sambaphone code, so I can call the help line, which I do when I get home. The phone tree takes so long, that right before I get to a real person, I run out of minutes and the call is cut off (the phone knows it’s been defeated so it’s getting in some last jabs on the way down). So I get dressed once more to head over to the convenience store to buy more minutes where my day is very briefly enlightened by the little old Yemeni man who sometimes works the counter. He has the talent that many grandfatherly types have of complimenting you like a father rather than a lecher, so he makes me feel good. Up until that day, I’d never used any Arabic with him, but that day I asked for the phone minutes using Arabic numbers and he was so amazingly happy to hear me do so, I thought he would turn inside out. Bolstered by positive human interaction, armed with plenty of phone minutes, I return home and call the Sambaphone. Finally get a real person and explain the issue once more. The answer? Use the second address line. 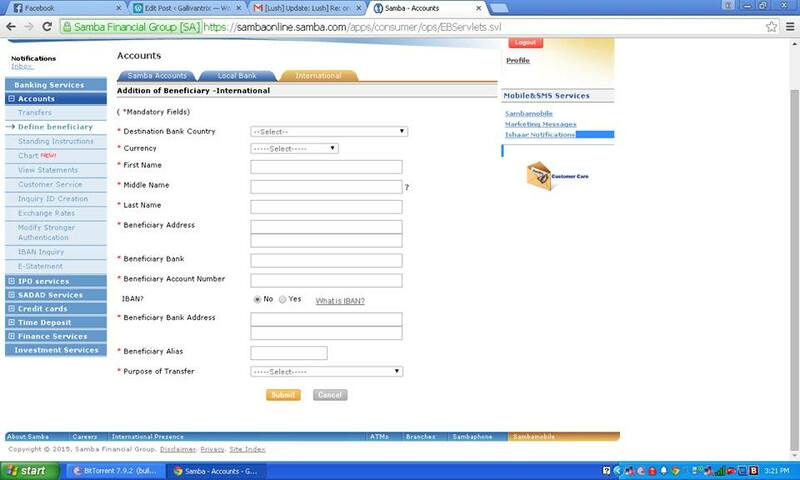 Put the whole bank address in the first line, and in the second line type “ABA” then a space then the number. Why? Why make an online form that requires specialized non-intuitive knowledge of what to put where? Why can’t you just write a few lines of code and add an ABA box???? Anyway, this man seemed to know exactly what I was talking about and explained the solution very clearly, so I had a lot of hope as I logged back on and tried the solution. Of course, these form lines have limited characters, so the whole address doesn’t actually fit in the first address line so I remove spaces and abbreviate everything I can and hope it works. After waiting a couple days with no failing text messages, I log back on the website to see that the beneficiary is now listed as “active”! Still cautious, I send myself a mere 25$ to test the transfer. The fee is 50SAR regardless of the amount transferred, but I feel like it’s worth it to make sure it works before sending thousands, because I can’t even imagine the nightmare if the connection wasn’t working and all that money left my Saudi account and never arrived in the US one. Trust but verify. After a couple more days, I check my US account and LO! the money is THERE! Happy victory dances ensue, celebrations and affirmations! Endorphins run wild! After 5 months in Saudi, my dwindling US savings running dry paying student loan and insurance bills while no new money comes in, I can finally use the money I’m earning to accomplish the financial goals I set out to do when I took this job! Staring at that tiny transfer, I felt like I’d just made the Death Star run with the guidance computer turned off, and I could hear the pumping brass of the “Throne Room” music ringing in my ears as Princess Leia gave me a medal for defeating the Empire. I also managed to file my US taxes entirely online this weekend, and should be receiving that refund direct deposit soon. I don’t think I’ve been so excited to be able to pay bills since I cleared out the last credit card. I realize too that if my stories keep following Lucas, that the next episode is not going to be good for me. Whatever the bureaucratic equivalent of loosing a hand or being frozen in carbonite is, I don’t want to find out. Inshallah, I never will. Finally, a month after my birthday trip to Dubai, I’m bringing up the rear with the last-but-not-least-post about the world’s tallest building. If you want all the stats about the height and amazing construction efforts, the largest this and fastest that, you should go read Wikipedia, I’m here to talk about the experience. After my lovely boat ride down the Dubai canal, I caught that coveted taxi and headed over to the Dubai Mall. That is the giant mall structure that rests at the bottom of the Burj Khalifa, next to the beautiful dancing fountain in the world’s largest artificial lake. The entrance to the Burj Khalifa “At the Top” experience is inside the mall. The mall itself is, like all Dubai malls, huge and awe inspiringly wealthy. On my way to the entrance, I passed the display for the aquarium inside the mall – a two story high window showing off the underwater reef and fish display. After some research I had decided to buy my tickets online in advance for two reasons. One, it’s much much cheaper. Deciding to go to the top at the last minute will cost you big bucks, so if you’re heading to Dubai, and want to catch this attraction, go the website and book ahead. When you do this, you pick a time. The website advises readers that the ticket is only good for getting in at the specified time, but once you are at the top, you can stay as long as you like. The website also says that the tour typically takes 90 minutes. What it should say is that the line typically takes 90 minutes. Even having purchased my ticket in advance, and arriving 20 minutes ahead of my ticket time, I had to stand in line to redeem my online receipt. Then I had to stand in line to get to the line inside for the security sweep. Then I had to wait in line for the elevator (world’s fastest). Meanwhile we are packed in like sardines, there is nothing to look at but an endless loop video telling about the Burj Khalifa that none of us could hear over the crowds. There is no where to sit, nothing to drink, no bathrooms, just standing in line for 90 minutes. Disney Land has shorter lines. Now, to be fair, the line may have been excessive because it was both a weekend (Saturday) at I had chosen to go in a time slot that should have allowed me to see the sunset from the top, which is a very high demand time as you may imagine. Maybe if you go off-peak, you’ll have a shorter line. Your other option is to pay nearly double the ticket price to get the “fast track”. This one might be worth it. It’s about 45$ (US) for a peak time ticket, and about 80$ for the fast track. Either one seems like a lot of money to me to go up a building, but hey if you want to go to the tippy top VIP balcony, you’re looking at 135$. And who knows, maybe that’s worth it too, Dubai does know how to lay on a VIP treatment. I’m permanently going through life in “poor college student” mode, so I tend to opt for the cheaper choice. So there’s me in line. When we finally get to the elevators, we’re told these are the fastest elevators that will take us up in less than a minute. Considering they packed us in to absolute capacity, that was a relief. I’m not usually claustrophobic. I managed to ride the subways in Beijing where they literally shove people in at rush hour, but after an hour and a half of being scrunched up in the line, being even more scrunched up in the elevator was not fun. Some people took video of the floors ticking by so fast, and while that itself is a kind of cool experience, I didn’t think it would be fun for you all to watch. It does bring up an interesting idea of how time and space are linked in our perception. We grow accustomed to traversing a certain amount of space to take a long time, the larger the space, the longer the time. So while the fastest elevator may be a marvel of technology, it seriously distorted my body’s perceptions of how high we had traveled. I wonder if the first people who traveled in airplanes from city to city had a similar experience of distance distortion. We piled out of the elevator on floor 124 (not actually the highest floor but, I didn’t want to pay for the floor 148 experience (almost 100$ more than what I had already paid). And it was pretty crowded. Not surprising. The first part was the outdoor viewing platform. Similar to “The Experience” at Al Faisaliah, the platform was surrounded by very high, very strong clear glass walls. I have to admit, that was pretty impressive. There is something really magical about feeling the air from really high places. It was crowded, but I was happy to be there finally. I wandered around the edge of the platform, admiring the view, enjoying the breeze and lingering sunlight, and trying to wrap my head around the sheer scope of what I was seeing. Partially, because everything in Dubai is built huge, so it’s hard to feel a sense of scale just from the surrounding architecture. Most of the buildings we can see here are between 50 and 90 stories tall themselves. The distance to the horizon is somewhat more helpful, but since I had never even come close to such an experience before (not even the Empire State, which at 103 stories would have been 21 stories below me). The tallest building in Seattle (my hometown) is 76 stories. It was almost more like I was looking at a model of a city rather than a real city at a distance. Combined with the super speedy elevator trip, it made the whole thing very surreal. Finally I headed inside. The outdoor platform was not 360, and looked more or less east. I had booked a time to see the sunset, so I wanted to get to the west side of the building before the main event. The website advertises an “unobstructed” 360 degree view from the top. This is not realistic. Not only are there way too many people to get a clear view, but there is a giant gift shop in the middle, and a green screen souvenir photo set up on one end. There are windows everywhere, and you can walk around and see the whole thing eventually. I got the obligatory “world’s highest selfie”. Getting close to a window was really quite a battle, though. Perched at what was certainly the best sunset viewing window were three European tourists. They weren’t even looking out the window, just sitting in it playing on their smart phones. I mean, ok if you want to Instagram your world’s highest selfies, take a couple seconds, but to spend the $$, wait in line, and then just sit there on your phone? I tried to politely get past them to take pictures, and finally one of the staff came by and made them move. No one who was actually taking pictures or actively admiring the view was asked to move, by the way, so I was happy to see that even if the tourists thought they could do whatever they liked, the staff were trying to be fair to everyone. I stood in the press of people patiently admiring the orange red glow in the west. We should have been able to see the Burj Arab too, that giant building that looks like a sail on the coast of Dubai, but it turns out that the air quality in Dubai isn’t that great. The reasearch I did online seems to indicate that it should be in the green zone, under 50 on the AQI (air quality index, Seattle is around 8, and the worst parts of China are now breaking 500), so maybe it was the reputed “dust fall” but there was quite a serious haze in the air. It was a little bit disappointing, because I can only imagine how spectacular the view would have been if the air were clear. I don’t mean to whinge. It was a cool experience, and I’m glad I went. But, I don’t know if I’ll ever go again. And I’ll certainly have some choice advice for anyone who hasn’t gone and wants to. 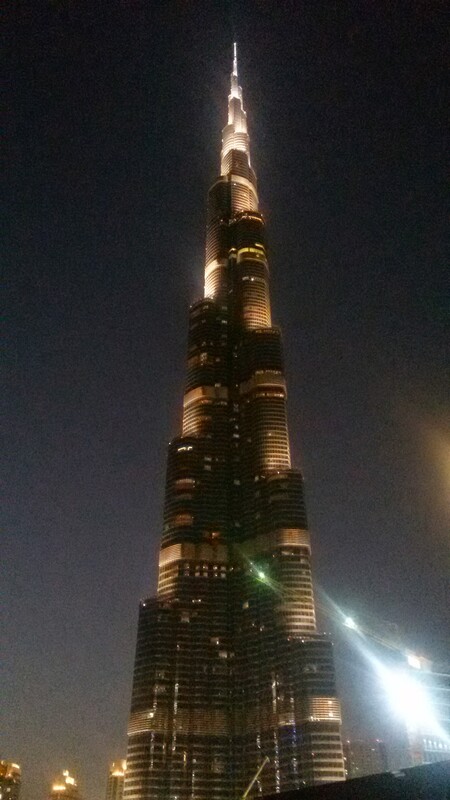 I should mention at this point that I was heading straight to the airport from the Burj Khalifa. My flight was at 9 and FlyDubai says to arrive 3 hours early for an international flight. Sunset was at 5:30. I’d already determined the 3 hrs wasn’t going to happen, but I figured 2 and a half was probably enough, especially since I didn’t have checked baggage (oh the glorious joys of flying without checked baggage). So shortly after the glow dipped below the horizon I started to plan my exit strategy. The website had also indicated that there were “official” souvenirs that could only be purchased by one who had got the “At the Top” ticket, and other souvenirs that could be purchased in the mall. I don’t like big gaudy souvenirs, I don’t collect T-shirts or spoons or anything. I have a small shotglass collection, but those are mostly from bars, not souvenir shops. But, I do like odd unique items sometimes. So I wanted a quick look around the souvenir shop before I headed out. Have I mentioned the crowds? Crowded. I ducked and weaved my way around the crowds until I found a cute little phone dongle and a lapel pin with the outline of the building. Small cheap but hopefully durable souvenirs with the “exclusive” label so I could rest assured they were at least unique to ticket holders. Finally, I’d had more people than I could handle. While I had really hoped to see the city lights come on after the sunset, I couldn’t physically handle the crowds anymore, and was starting to get the adrenaline/anxiety combo that had totally eluded me when standing right at the edge and heralded the onset of a mild anxiety attack. There was a line for the elevator to go down. So I stood in line some more. I don’t know how the fastest elevator stuffed to capacity still takes so long to move people that we had a line to go down. Up I could almost understand, maybe they wanted to wait for a certain number to come down before letting more up because it’s really kinda tiny up there. But down? When I finally got down, I had the long walk of the Disneylandride-esque line on the other side (where, for some reason they had decided to put all kinds of pictures and stories for us to read on our way out when we were in a hurry instead of on the way in when we had to stand around forever). Then I was dumped into another gift shop (I keep seeing the Disney Land similarities), where I was dismayed to see the same items I’d purchased at the top. It turns out the shop can’t be entered by mall patrons, so they weren’t lying about the exclusivity, but I really feel like they could have provided a better viewing experience if they’d cut out the gift shop and let us look first and shop later. Plus the gift shop at the bottom was roomier, less crowded and had more stuff. I took a quick look around to make sure there wasn’t anything else to my tastes (almost bought a scarf, I have an addiction), before glancing at my watch and beginning to panic about my flight. It was already 6pm! Quickly I darted for the nearest exit, and was greeted by the famous Dubai fountain in full performance as soon as I stepped outside. Airport be damned, this was worth stopping for. Sadly, I didn’t get any pics or video of the fountain in action, because I walked out after it had already started, phone in bag and stuck at the back of the crowd, but what I saw was amazing. That big blue swimming pool looking thing you can see from my picture at the top is actually a lake where the fountain is. This almost makes me want to go back at night so I could see the fountain show from the air. I am going back to Dubai next month, and I do plan to make sure I get a good view at least one night I’m there, even if only from the ground. Worth it. I am an achievement junkie though, so for me, being able to tell the story of when I watched the sun set from the world’s tallest building is the prize. My advice to anyone else? -of course buy the tickets in advance. I’m willing to bet if you want to go off peak, you can probably get by with a shorter line than me at the cheapie tickets, but if you want to see the sunset, or go on a weekend, spend the extra cash for the Fast Track tickets, those guys were definitely speeding past us. And if you’re flush with cash, check out the VIP and tell me what it’s like. -don’t bother shopping at the top, everything they have there is in the shop at the bottom. -show up early, get to the ticket counter at least 30 minutes before your ticket time, which means get to the mall at least an hour before, because you have to walk what seems like several km to get from the mall entrance to the ticket counter. -be careful what you carry with you. there is a security station that forbids luggage (backpacks seemed ok) and shopping bags (odd since they’re in a mall). -use the restroom before you get in line. I didn’t see one again until I got back out into the main mall. Other than that, enjoy it. I had some frustrations, which hopefully if you go after reading this, you can avoid. But the end result was a rare experience, because even if I go back to the top again, I’d go at a different time or day, and see different things. I’m glad I went, and for anyone who likes to build memories of awesome adventures, I recommend it. I had plenty of time to stretch my legs, explore the duty-free shop (where I got myself a beautiful new hijab, black with one edge done up in blue and silver embroidery. And to make some new friends in the waiting lounge, a nice woman from Kuwait who chatted with me about the cultural differences between Saudi and Kuwait while we waited for our flights. On the plane, I was still in “western” clothes, my abaya and hijab tucked away in the bottom of my backpack. I was quite surprised when a Saudi gentleman addressed me to ask if I wouldn’t mind moving from the aisle to the window seat. It’s not uncommon for men and women who are not married to trade seats around to avoid sitting next to one another on planes here, so I took the window, he took the aisle and his wife sat between us so everyone was safe. It was surprising because I was used to being addressed only by women if a married couple needed something, or by a flight attendant if the man single, but I figured she might not speak English, and after all, we were in Dubai still. We chatted a bit more on the flight, I think he must have lived abroad before to be so comfortable talking to a woman who wasn’t covered, and not being at all skeezy about it either. Pro-tip, order the hot meal when you buy a ticket on FlyDubai, totally worth it. When we landed and I got my backpack back from the overhead bin, I reached in and pulled out my abaya and hijab to put them on before disembarking in Saudi. There were several relieved faces from the men around me as they saw me getting properly dressed, and the gentlemen who shared my row gave me a compliment on my hijab donning technique, saying that I must have had some practice to become so proficient. It was really an interesting cultural moment. Clearly these men were braced for the fact that an abayaless woman was about to get off the plane in their country. I’d seen it in the Riyadh airport, where most international flights come in, but this was Tabuk! Yet none of them were chastising, or even giving me dirty looks, they were just prepared to accept that I was different. But the moment that I showed my acceptance of their culture despite my differences we connected in that special inter-cultural space that says of course I don’t live your way, or understand your way, or even like your way, but I’ll respect you. None of us had demanded our own way and were all prepared to be a little uncomfortable to make the other feel better, and I think we were all happier for it. It was a good trip. However amazing my Friday was, the trip wasn’t over yet. Saturday I’d planned a bus tour for my Saturday as well as a trip to the top of the world’s tallest building. And, since I’d paid for these tickets in advance, I decided I’d better follow through. Saturday morning was a particularly slow start. The bus didn’t come to the nearest stop until 9:30, and I figured since I was out late, I wasn’t going to worry too much about waking up super early. That turned out to be irrelevant, as my school teacher internal clock had me awake by 7am. I had a leisurely breakfast, if a somewhat mild one, of cornflakes and toast, and generally tried to starch and hydrate the remains of a hangover away. In the midst of this, I realized that I’d somehow not only used all the gb of international internet I’d purchased on my phone, but hadn’t turned the data off, so I’d used up all the remaining balance on the SIM card. Which meant I spent a very unproductive 30 minutes using the hotel wifi to try to find a way to recharge the phone credit from the internet, which it turns out you can’t do without a Saudi bank account, which I still didn’t have at the time. Oh well, I say, time to see the day anywho. By this time, I’d missed the 930 bus window, but another was due by 950, and the mall where the stop lay was about a block away. It bears mentioning that the malls in Dubai are HUGE and not especially geared for pedestrian entrance. Mall of the Emirates was not an exception, and due to confusing parking lot signs and a lot of construction, I walked at least halfway around the building before I found a way in. I found a mall map which told me how far I had to go to get to the bus stop, and headed in the correct direction. On the way, I got a delicious avocado and banana smoothie with a shot of pure ginger juice to finish kicking out the hangover cobwebs. Totally hit the spot. As I walked through the gigantic mall, admiring the Christmas decorations and ritzy shops, I spotted a display that looked like a giant scene from “Frozen”. I looked closer and realized it was real snow. Gaping at this multi-story indoor snowscape, I recalled stories about the famous Dubai indoor ski slope. I’d seen it was close to my hotel, but since I can’t ski and didn’t have very long in Dubai, it wasn’t on my to-do list. It turns out, it’s actually inside the Mall of the Eremites, and I was walking past the full wall window display that leads up to the ticket entrance. So after some ooos and ahhs, I continued on toward the bus area. Now, the cool thing about a hop-on-hop-off bus is that inevitably you’ll catch it where you disembarked, but that first stop can be a little tricky. The phone app that the company had sadly did not include any directions or gps for the stop beyond “at the Mall”, so it took me a while to track it down. It turned out to be in an underground parking garage, one I’d passed while searching for an entrance to the mall earlier. The avocado smoothie and indoor snow land made up for the detour, though. I caught a bus, and there was some conflict over which line it was. Both the website and the app indicate that the company offers a “red” line and a “blue” line, there are maps and descriptions of all the stops. According to both, the mall was only on the blue line. And the driver was talking about the “beach” line, which made no sense. Initially, he told me I needed a different bus, but then he changed his mind and waved me on. I was the only person on the bus, which was a little eerie. As I unfolded the map the driver had given me, I slowly realized that the website and app were both outdated. There were in fact three routes, and the previously labeled blue line was now green, and the new third beach route was now blue. Hence the confusion. And as it turned out, I was on the wrong line, going the wrong way. So at the next stop, I hopped off and switched lines, and finally around 11am I was on the right bus going the right way. Other than a slight snafu with the planning, I was really impressed with the bus tour. I’m not a huge fan of organized tours or heavily touristy activities, but the hop-on-hop-off style basically allows you to design your own tour, and not have to worry about transportation, since you can always catch the next company bus that comes along. Plus, in addition to your transportation, it included entrance fees to a ton of sights, museums, boat rides and some kind of desert safari, only a few of which are mentioned on the website. The buses have recorded tour tracks if you like to listen to city information, and free wifi. I wish I’d had more time. I didn’t realize how much stuff was on that tour when I did the website research, and I got on the bus about an hour and half later than I’d meant to. But what I did see was lots of fun (so much so, I’m planning the two day version for my next trip so I can see everything the ticket includes!). I had booked a 4:00 ticket for the Burj Kalifah, which meant I needed to drop everything and taxi over there at 3:30 at the latest. And I really wanted to take the boat ride along the Dubai canal, since that was one of the things on the website I’d found and it was recommended to me by a fellow PNW American who’d stopped in Dubai on her way into Saudi. The boat was due to go out every hour on the half an hour, and I made it just in time to catch the 2:30 boat (getting me back to catch a 3:30 taxi to my 4:00 tower experience, or so I hoped). The boat was entirely lovely. When we got off the bus, it hadn’t pulled up to the dock yet, so some Dutch tourists and I ended up walking down the docks into a shipping area which made for an interesting detour and we got to see the boats that the locals use for cargo between countries around the Persian gulf. The weather was beautiful and the views spectacular. It really was a great ride and a nice way to see the city. We got back to the dock just in time for the next tour bus, but I needed a taxi. So I let the bus go and tried to flag one down. I don’t know what the universal law is that makes it so that taxis are trying to flag me down when I want to walk somewhere, but all of them are full when I want a taxi, but I was starting to worry that I wasn’t going to make my ticket time for the tower. Just as I was prepared to start hiking to the nearest hotel or mall, I finally found an empty taxi, and slumped with some relief into the air-conditioned cab and settled in for the cross town ride. One of my favorite parts about travelling is meeting cool people and having random adventures. This has not always been true. While I have always enjoyed talking to strangers, I’ve only recently learned the power of “yes” (and while I usually hate self help tag lines, this one isn’t too bad). I never read the book, I heard a story on public radio about a woman (maybe the author?) who had learned that saying yes gave rise to more adventures and a generally happier life. I like the idea. I used to be a rigid schedule kind of girl, and if unknowns entered my plans it was very hard for me to change them and be comfortable. For a while I solved this by planning spontaneous time. I would schedule times in which anything was allowed to happen and I would be ok. Outside of these times, everything needed to go according to plan. No I haven’t been tested for Autism, thank you. In 2012 I decided that my new life goal was to be happy. Maybe one day I’ll write more about what that means or how I found it, but today, suffice it to say that one of my many tools for happiness is learning how to seize adventures, be more spontaneous and enjoy what the universe offers. So, at the end of my delicious champagne brunch at Al Qasr, I found myself sitting on the patio, nursing a mojito and a final flute of prosecco and watching the tipsy diners around me. I’m a complimentary person. I like making other people feel better. My mother does this thing where she finds something nice about a person no matter what, and if you can give a genuine compliment, people feel it and it makes them feel good, which is awesome. So, throughout the brunch, whenever I’d run into someone and it seemed reasonable, I would pay them a compliment. At the table next to me was a trio of young women, and I happened to compliment one on her dress, a cute powder pink dress with a short skirt made entirely of feathers. I thought it was cute and told her so. Then her friends asked if I wanted to take a picture with them, which seemed odd, but I still haven’t quite grasped the Instagram culture, so I said “sure”, and stood up to join them for snaps. We used my phone, and of course I wanted to share the pictures, so we tried to co-ordinate sending, but in the Gulf all that is done on Facebook in the US is done with What’s App, which I had only just downloaded and had no real idea how to use. So they invited me to sit while we figured it out, and between the champagne and the new app, I had to hand my phone over to one of the ladies so they could add their number and send the photos, but it was a success and in the mean time, we enjoyed chatting so much, they invited me to move my stuff over and stay at their table. They were all quite tipsy too, which is really half the point of the Friday brunch, and we worked our way through the remaining drinks and coffee, chatting about our lives and continuously telling the staff we’d leave really soon. It came to light that the girl in the pink feather dress was a person of some fame in India and the Gulf. I’m horrible with famous people in my own culture and have no idea who is famous elsewhere. And no, I didn’t get her full name, and I wouldn’t post it here if I had because that is not the point of the story. At first, I actually thought they might be making it up. I have friends *ahem* who have been known on occasion when travelling to fancy places to pretend that one member of the group is famous as a kind of game. It’s fun, and really mostly harmless, especially since the advent of smart phones and google. And since these women didn’t seem to want anything beyond company, I wasn’t concerned if they were just having me on. One girl kept saying to the wait staff whenever they would come ask us to leave, “Do you know who she is?” pointing to the girl in the pink feather dress. Most of the staff would say, yes of course, and continue politely telling us it was closing time soon. But then one waiter asked for an autograph. I don’t know if he recognized her or just wanted to get one in case, but it certainly lent to the air of fame at the table. The ladies nicknamed me “Kimmie” fairly quickly and decided that they liked me and so invited me to join them at “Eden” after we left the restaurant. Here is where the power of “yes” and the newfound plan changing spontaneity comes in. My plan for Friday had been to enjoy brunch which ended at 4pm, have 2-3 hours of “anything goes time” during which I’d hoped to see the Burj Arab because it was so close to the restaurant, and then go to the famous dancing fountain at the base of the Burj Kalifah which started at 6pm and went on and off for a few hours every night. My plan. I’d already spent most of my “anything goes” time with these women, because while the food stopped at 4pm, we stayed on the balcony drinking and chatting until the sunlight started to fade. And I was fine, I was happy, I felt like interesting people and a fun conversation were more than a fair trade for a building. The old me would have been paralyzed at the thought of changing my plan. How could I ever see the fountain? This was the only time I had plotted out during the visit it would be running! How can I go to a club with strangers? Alone and in a foreign land? The old me. One of the ladies had a mildly intoxicated altercation with management somewhere around the final no-really-everyone-out time, and as we were heading towards the taxis, in order to distract her, I told her I was in Dubai celebrating my birthday. Perhaps just as improbably and often used to elicit fun times as pretending to be famous, it happened to be true for me. And made a fantastic distraction. She immediately went from melancholy anger to jubilant singing of “Go Kimmie, it’s your birthday, we’re gonna party like it’s your birthday”. So after taking a few more random instagramable moments with some total strangers, the ladies shepherded me into their cab and we headed off into the sunset. First stop was our pink feather dress starlet’s home for (you guessed it) more drinks and some pre-club music. If the reactions of waitstaff at the restaurant had not convinced me, the apartment might have. Beachfront. It was a beautiful apartment, quite spacious and well appointed. Her S.O. and another man were there when we arrived, having just woken up, along with a maid of some minority who did her best to simply serve drinks and stay out of the way. We headed out to the balcony, although balcony is not the best description, it was more like an open wall third bedroom. There was a circular day-bed on one end, in a matching circular alcove in the wall, a couch, and a table and chairs. The view over the Persian Gulf was quite lovely. 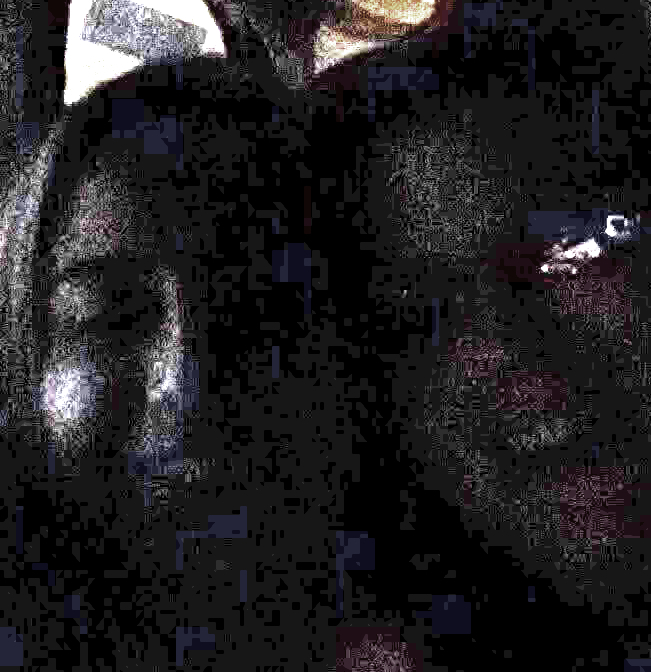 We enjoyed our drinks, were silly, danced and reassured each other that we were all quite beautiful enough to be seen at the club without any additional makeup or changes of wardrobe, and then we migrated back to the taxis where I tried to take selfies of us in the dark… <3! 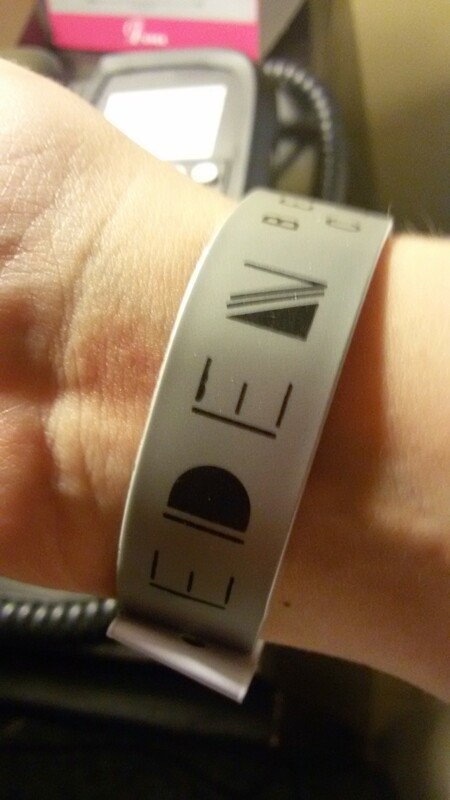 I had no idea what Eden was beyond a dance club. I looked it up the next day on my faithful Google and discovered it was a brand new (month old) beachfront club on one of the palm tree shaped islands. I’m not sure, but I’m guessing it might be kind of exclusive/hot-spotish. This is the calendar for the night I was there. 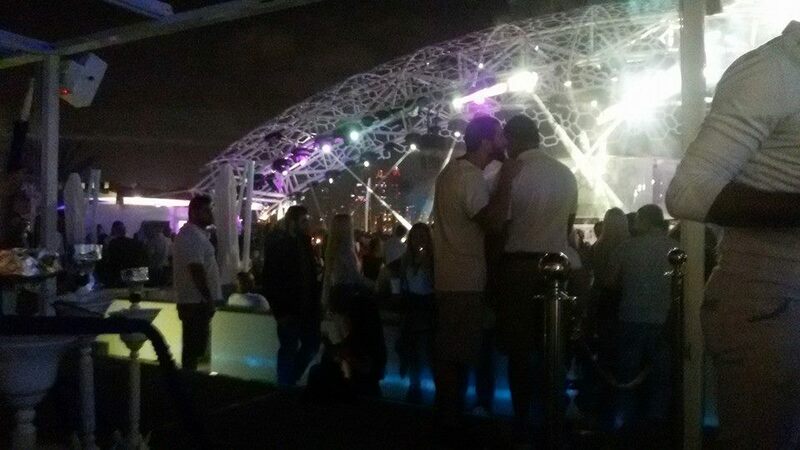 Matthias Tanzmann & Djebali were apparently the musical guests, and I’m not cool enough to know who they are either. But the calendar advises people to be there by 1pm and that a “door policy” applies. Again, no idea. I followed the ladies from the cab, one who had taken a particular shine to me made sure to keep hold of my arm so I would not be separated, and couldn’t hear what they said to the concierge, but we were wrist-banded and shown in to what was almost assuredly a VIP area. We were elevated, there was a semblance of roof (though after sunset that mattered less, some very lovely couches and a TON of space for us marked off from other similar areas with little velvet ropes. The people in front of us with no roofing were also packed much more like dance club sardines would expect to be, hence my conclusions as to our group’s status. We ended up with two very tall white porcelain hookahs with minty shisha (my favorite flavor), and a bottle service of grey goose, which I believe was mixed with red bull. A waitress showed up at one point with the bottle which she placed in a bucket of ice at our table, and several glasses, asking me because I was closest I suppose, what we wanted in our drinks. Wisely, I did not take charge of this choice but asked one of my hostesses, who made the red bull decision. The music was physical. It went into the bones, and pressed on the ears, but perhaps because we were outdoors, it didn’t feel as deafening or crushing as indoor superloud dance music. The light show was also rather … sensory. I had the sense to take some video, mostly because I was so stunned at how my night turned out that I felt the need to post it on facebook. I don’t seem to be able to post them on wordpress, so here’s a link: Post by Gallivantrix. Around 10:30, the ladies were ready to call it a night, so I graciously took my leave and a separate cab, thanking them again for the company and the experience. I was, I must admit, astonishingly happy. There I was celebrating my birthday in Dubai, not only with a fantastic champagne brunch, but with a jaw dropping night out on the town courtesy of some fun, kind strangers and my own openness to adventure. I could not imagine a more perfect gift than to have everything I had been working toward in myself: happiness, gratitude, confidence, inspiring others to feel good, being open, and having more adventures – all come together in one amazing day. It really is good to be alive.